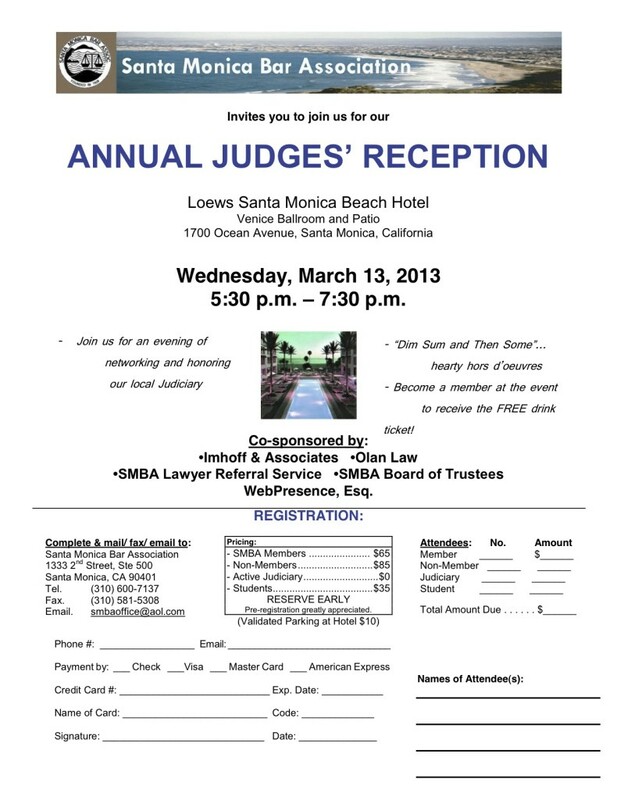 Santa Monica Bar Association Annual Judges’ Reception – March 13, 2013 – Web Presence Esq. WebPresence, Esq. is delighted to sponsor the upcoming Santa Monica Bar Association Annual Judges’ Reception. On March 13, 2013, Southern California lawyers and legal professionals will have a chance to network while also taking a moment to honor the local judiciary. This will be a great opportunity to dine and connect with fellow members of the bar in a gorgeous setting outside of the courtroom. As we always say, building your network in person is just as important as building your network online! The event will take place at the lovely Loews Hotel in Santa Monica. For more information on the event, please contact Kristen, who is also an SMBA Board Member and Officer.